Several different methods are available for conducting the neuroselective Current Perception Threshold CPT determination. This evaluation is a painless electrodiagnostic test that objectively evaluates sensory nerve functional integrity by measuring neuroselective current perception threshold measures with a resolution of +/- 20 μAmp with a p<0.006 . There is an established normative sNCT® current perception threshold measures database that has been reliably reproduced internationally. All normative CPT values are based upon the standardized double-blind forced choice testing paradigm. The Neurometer electrodiagnostic stimulator automates this procedure. Double-blind measures are obtained independent of operator input. This automation and standardization removes tester and testing method factors from effecting CPT measures. The CPT determination begins with the stimulating electrode(s) in place with the Neurometerr in the “Intensity Alignment Mode”. The stimulus intensity is slowly increased from zero to a maximum of 9.99 mAmperes until the subject reports detecting a sensation around the site of the electrodes. The stimulus is then turned off and re-presented at decreasing intensities until it is not detected within a range of 0.10 mA. Next, the patient begins the “Automated Forced Choice CPT Determination Mode” to determine the actual CPT measures. This mode follows a testing paradigm similar to that used in standard auditory tests and determines the patient’s CPT measures to within +/- 20 µAmperes. 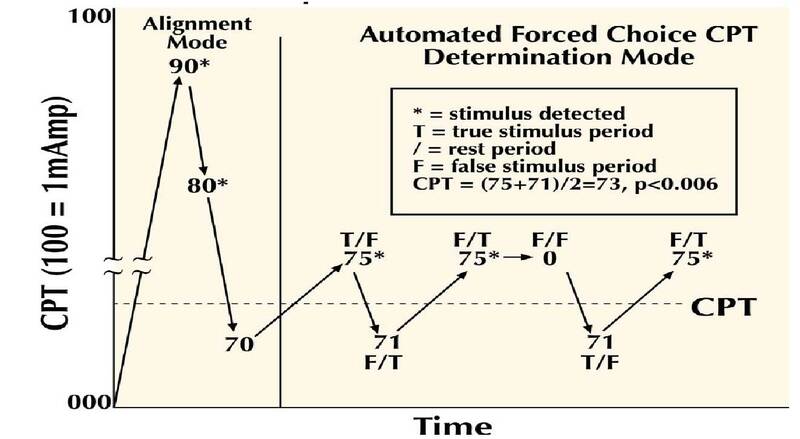 The patient is presented with a series of forced choice tests that consist of pairs of real and false (placebo) stimuli presented as a “Test A” and a “Test B” separated by a “Rest” period. The sequence of the order of the real and false tests is randomly generated by the internal microprocessor. A remote patient box has buttons paired with indicator lights labeled “Test Cycle”, “Test A”, “Rest/None” and “TEST B”. For each test period a different (optional) audible tone is emitted and the corresponding button light becomes illuminated. The patient is then told to indicate, either verbally or by pressing the corresponding button, when he or she detect stimulation at the site of the electrodes during “Test A”, “Test B” or “Rest/None” if no stimulus was detected. Based on their response, the CPT device adjusts the output level of the stimulus and randomly generates a new testing order for the next pair of tests in the series. When a sufficient number of consistent responses are detected (p<0.006), the final CPT value is displayed on the device screen. The CPT determined is defined as the average of the minimum intensity of the stimulus consistently detected and the stimulus 40 µAmperes lower that was consistently not detected. Randomly placed double false tests are presented to assist in monitoring patient responses for consistency and accuracy. The threshold must be obtained within 20 forced choice presentations or the test is invalidated. Because of the automated design of the CPT testing methodology, neither the patient nor the operator is aware of the device output parameters and therefore cannot influence the test outcome based upon subjective impression. This testing sequence is repeated for each of the three frequencies of stimulus before moving on to the next body site. The duration of the presentation of each test and rest period is a function of the stimulus frequency with longer durations for the slower conducting fiber stimulation. The complete forced choice CPT test, repeated at each of the three frequencies, requires approximately five to ten minutes per body site.